After just over five incredibly gratifying years at 123 Dundas Street, DNA Gallery and Bookshop will be closing its doors at the end of March, 2019. DNA would like to thank the incredibly talented artists who have exhibited with the gallery, as well as members of the community in London and beyond who were instrumental in supporting our space. We are extremely proud to have exhibited the work of countless artists, illustrators and authors, and have hosted over thirty exhibitions since opening in 2013. The gallery could not have been what it was without the incredible talent of our team, including Abby Vincent, Ruth Skinner, Thea Yabut, Anna Madelska, Sara Helm, Tegan Moore, Liza Eurich, and Neil Klassen. We will be forever grateful for their knowledge, professionalism and dedication. Thank you all for your support of our space. "An object which shines is an object that can be renewed by having its shine restored; it is a negentropic promise, and the promise of future rescindings." Through closely linked processes in sculpture, installation, and video, Tegan Moore uses experimental methods of construction and design often informed by projects in other fields such as manufacturing and environmental engineering. This past winter, she worked in conjunction with the demolition phase of a weather testing project in a full-scale house at The Insurance Research Lab for Better Homes. Here she found a space that enabled an exposure of the physical workings of the house through its unusual context both as a laboratory and as a place undergoing deconstruction literally piece-by-piece. Working with specific materials that both consume and mitigate the weather, A Negentropic Promise presents new constructions of nullified forms that exercise a logic of consumer products and make visible often unseen technical operations. 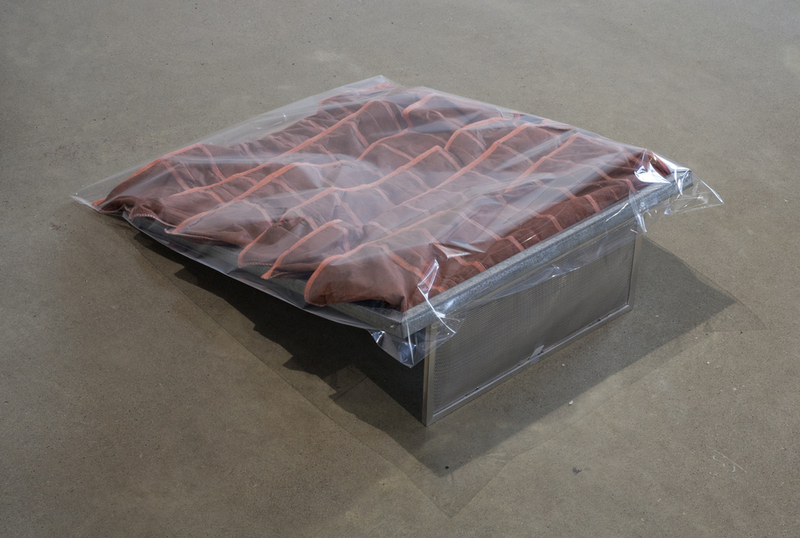 Forcing the removed, the exhausted, and the invisible into persistent production—Moore positions air, temperature, substance, and fragility in close proximity. The exhibition is a culmination of the artist’s work and research towards a Master of Fine Arts degree at The University of Western Ontario. Tegan Moore is currently based in London, Ontario. She received a BFA from Emily Carr University in 2008 and has since exhibited in Vancouver, Toronto, and San Francisco. Recently her work was included in Every Evasion at Vancouver’s Equinox Gallery and she contributed to Maggie Groat’s book project, The Lake, published by Art Metropole. 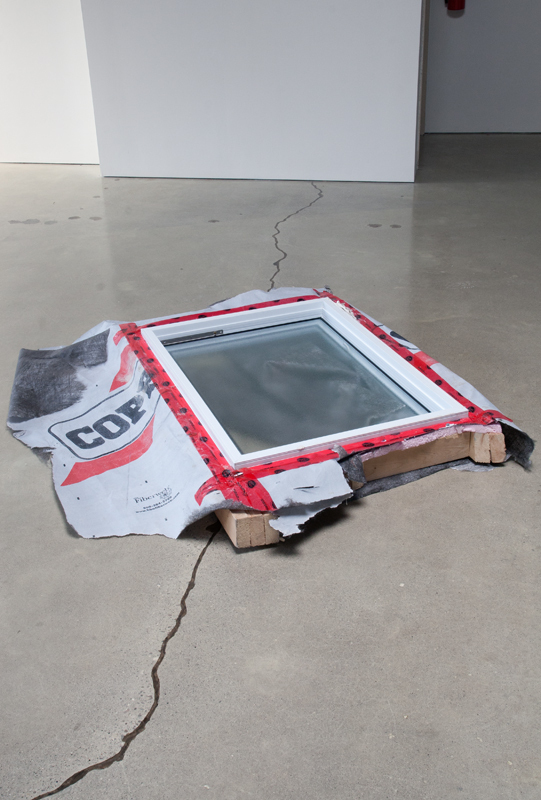 Moore’s upcoming exhibitions include Corruption of Time’s Dust at 221A in Vancouver, and Specs at MKG 127 in Toronto. New Grey Perth Drive, 2014. Shrink wrap, furnace filter, dust, pollen, allergen, mite, dander, skin cells, and other atmospheric particulate matter.